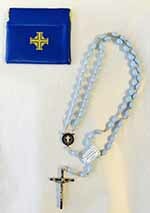 Columbiette Rosary with Case. Plastic light blue beads made in Italy. Metal die casted Columbiette Center.